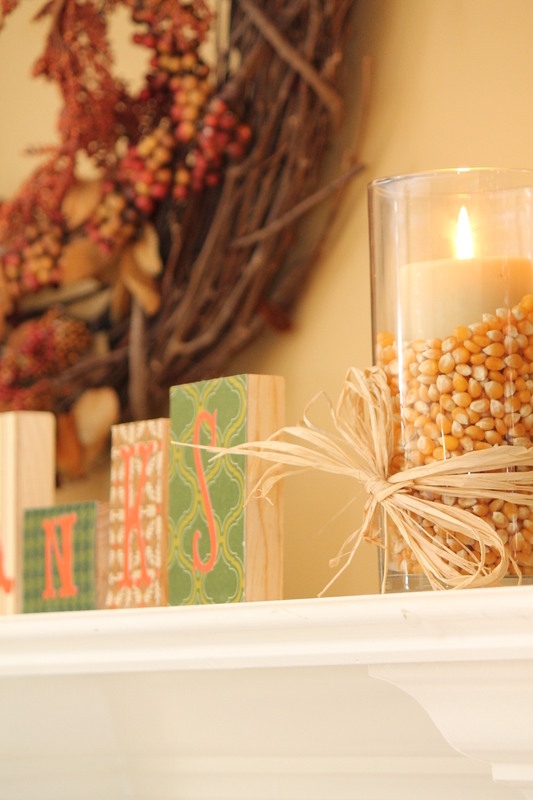 5 Great Ideas for Fall Décor! It’s that time of year again, the time of pumpkin spice lattes, hot apple cider, and warm fireplaces. Even in Texas where the changing of the seasons is less obvious, decorating your home for the occasion can be fun and add an inviting ambiance to any space. It can feel like summer until mid to late October here, so many people are hesitant to spend a fortune on fresh seasonal decorations. Good news… you don’t have to! We scoured Pinterest for the most creative and cost efficient fall décor ideas and we’re going to share them with you! 1. Decorate for cheap by updating things you already own! Decorating your home for fall doesn’t have to cost you a fortune. There are tons of ideas on Pinterest that we absolutely loved. One of our favorites was this candle idea from The Passionate Penny Pincher.They suggest buying cheap candles from the dollar store, but kudos if you already have a white, orange, brown, or otherwise autumn-hued candle around the house. Just buy a glass candle jar, fill it with unpopped popcorn, and tie some raffia around it. 3. Create a classy centerpiece. Wow your dinner guests (or your family) with a table centerpiece that says, ‘Hey, it’s fall!’ You choose how elaborate you want to make it, depending on how much work you want to put in. Centerpiece ideas we found ranged from a simple autumn-leave garland with a few strategically placed candles to pine cone arrangements to faux fruit and flower arrangements. Country Living came up with a great inspirational slide show to steal ideas from! 4. Make a wreath to hang outside. The first thing anyone sees when they enter your home is your front door, create a welcoming fall inspired wreath to set the mood from the get-go! Boho-chic is all the rage right now, and burlap is the fabric of choice for Boho fall décor. We found instructions on how to make your own wreath out of burlap and a few embellishments. In 15 minutes you can have your very own creation, simply follow directions in the tutorial here, or click the link below. 5. Incorporate apples. Apples are in season, and add a less overdone element to fall décor. It can be a bowl of fresh (or faux) apples sitting on your dining room table/kitchen, the addition of apples into your wreaths or living room décor, or party games (bobbing for apples, anyone)? The blog “This Silly Girls Kitchen” posted 15 great ideas for incorporating apples into your décor and we loved it. Happy fall! Feel free to also check out our Pinterest board for even more ideas!